Moscow (AFP) - President Vladimir Putin on Thursday said the US had put indirect pressure on the International Olympic Committee to block Russia from the Winter Games, adding it would be a "humiliation" for the country. The IOC is currently assessing if Russian athletes will be allowed to appear at the event in South Korea in February. Athletics world governing body the IAAF banned Russian track and field competitors from the 2016 Rio Games, after a World Anti-Doping Agency report on a vast system of state-sponsored doping. "We have no issue with the International Olympic Committee. 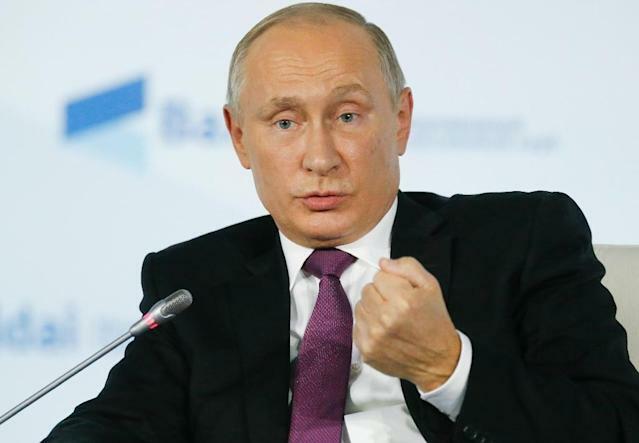 There are very decent people there, business people, but they depend on advertisers, television channels and so on," Putin said at an annual meeting with international relations experts in the Black Sea resort of Sochi. "These sponsors in turn are given unambiguous signals from certain American authorities. We are not just guessing about this, we know about this." The World Anti-Doping Agency report pointed to sample manipulation during the 2014 Sochi Winter Games. Russia denies any state-sponsored system of doping. "There are two options: either forcing Russia to compete under a neutral flag or not letting it go to the Olympics at all," Putin said after being asked if Russia would take part. "Either one is humiliation for the country" and would cause serious harm to the Olympic movement, Putin said. In September, 17 national anti-doping agencies called for Russia to be banned from the Winter Olympics in Pyeongchang.